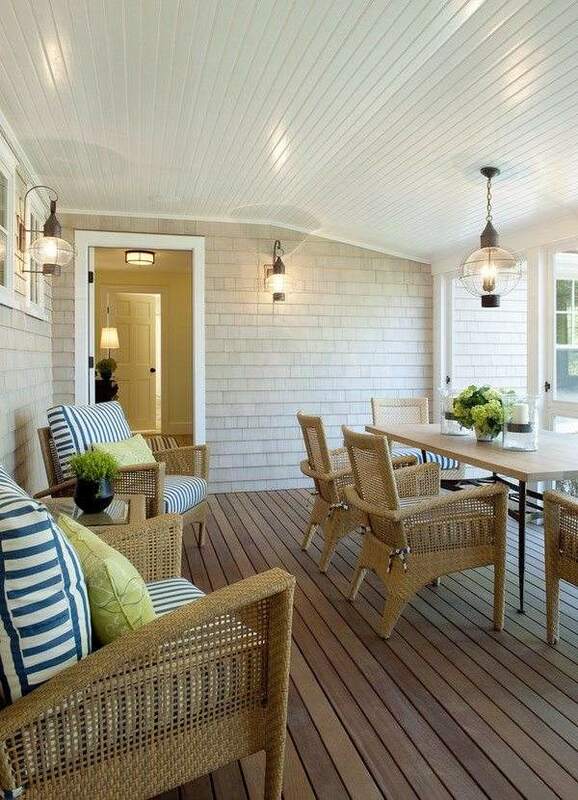 Porch flooring ideas or decking materials come in numerous options. 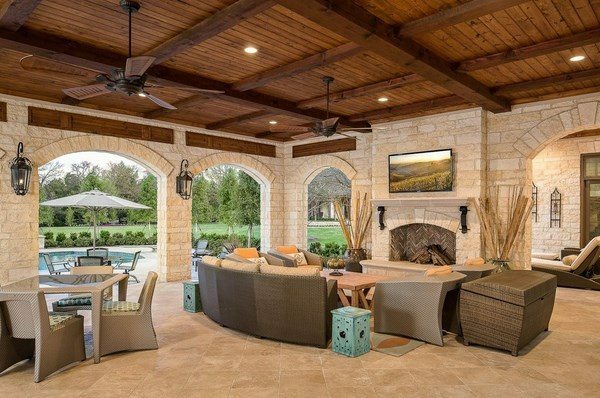 Creating a comfortable outdoor area allows you not only spend many hours in the open air with family and friends but increase the actual living space of the home. 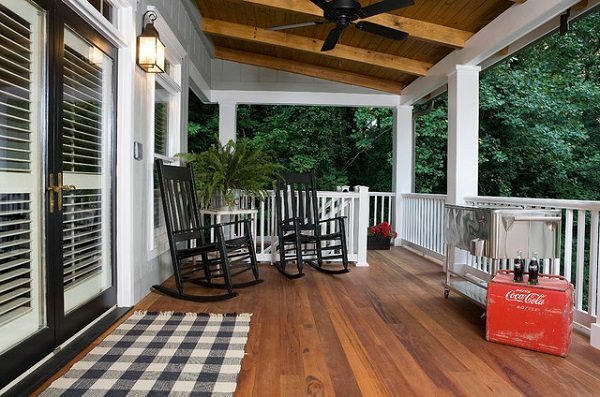 Whether you consider a suitable flooring for the front porch or the back porch, you will add a lot of value to your property. 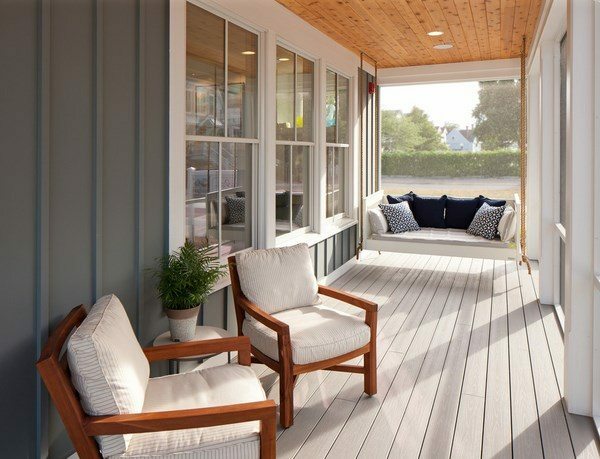 Porch flooring is something that everyone notices – neighbors, passers-by, visitors and you would want to make it unique and extraordinarily beautiful so that the house exterior has a finished look. 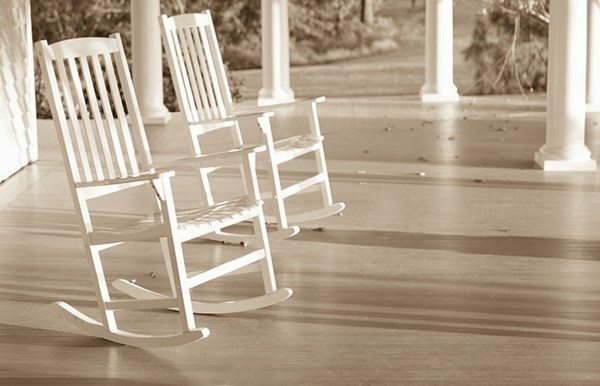 Porch flooring ideas – what to consider when choosing the flooring? 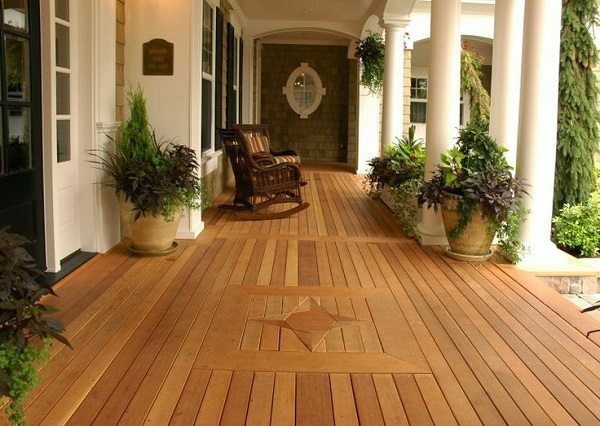 When it comes to porch flooring ideas or decking materials, there is one major difference between a deck and a porch. While a deck is open to the sky, porches are covered (roofed). 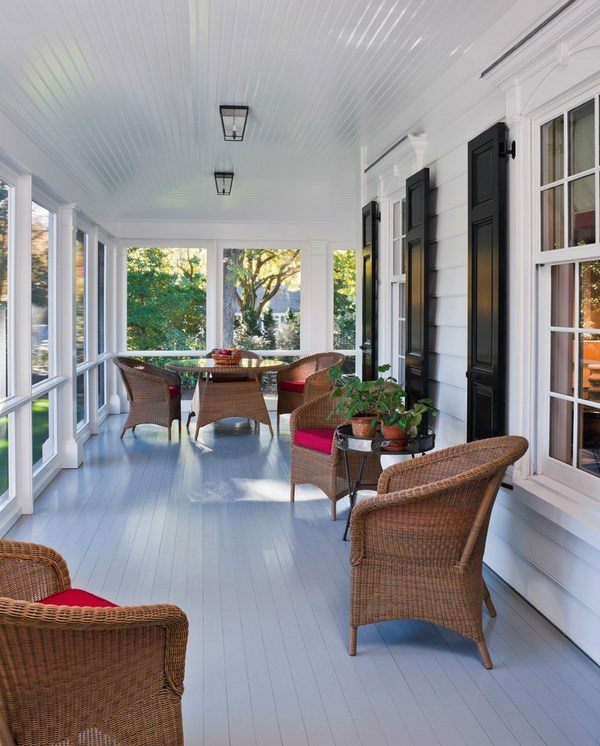 This allows more opportunities to choose a porch flooring material – from simple painting or staining to building a new floor – and you know that it will be protected from the elements to a certain extent by the roof. 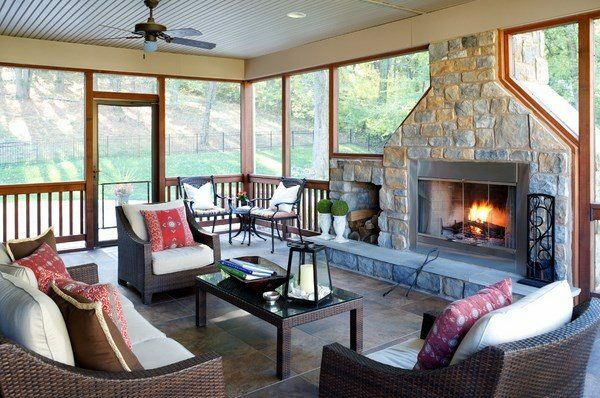 What are the main considerations that you need to keep in mind when choosing the porch flooring? On the first place, you need to consider the strength and durability of the material. Any outdoor area needs maintenance, eventual repairs or replacement. Make sure to understand the maintenance requirements of the material that you would like and keep in mind that higher initial investment may be worthwhile if you invest in a more durable material which has a long service life. 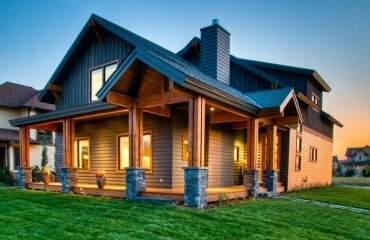 Another factor to consider is the structural integrity of the porch which means that you need to consider the type of foundation, support, frame, fasteners, etc. 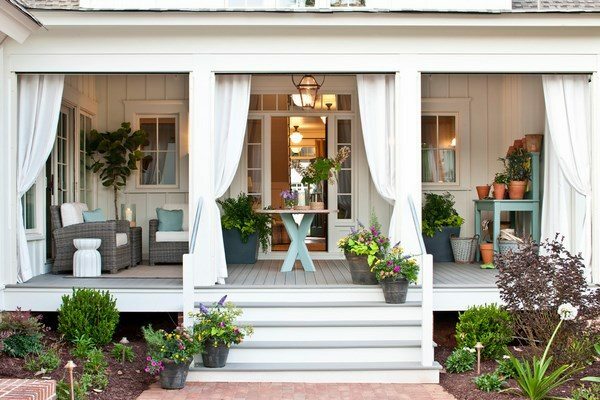 Think of your long-term idea for the porch – do you plan to screen the porch? 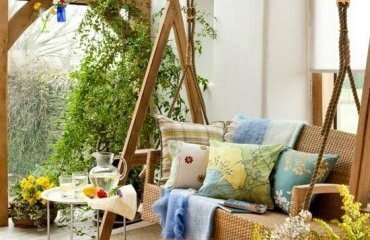 This may also affect the choice of porch flooring material depending on the way you plan to use the outdoor area. Consider the height of the porch off the ground. 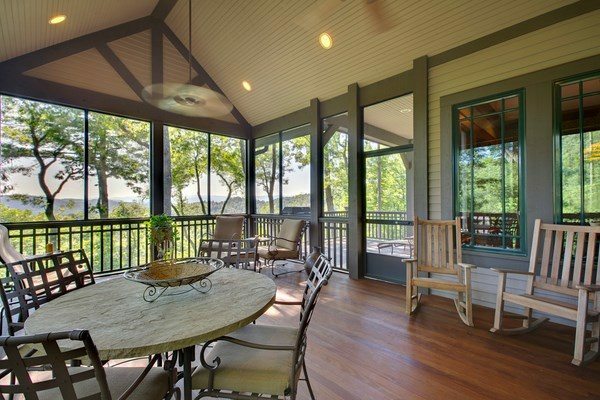 The climate conditions are another factor to consider when choosing porch flooring materials, especially when the porch area is not screened and exposed to elements. Further to that, some materials get hot and cold quicker, which is a serious concern for people living in hot climate areas. Appearance and style – those are major factors that will determine the choice of porch flooring material. 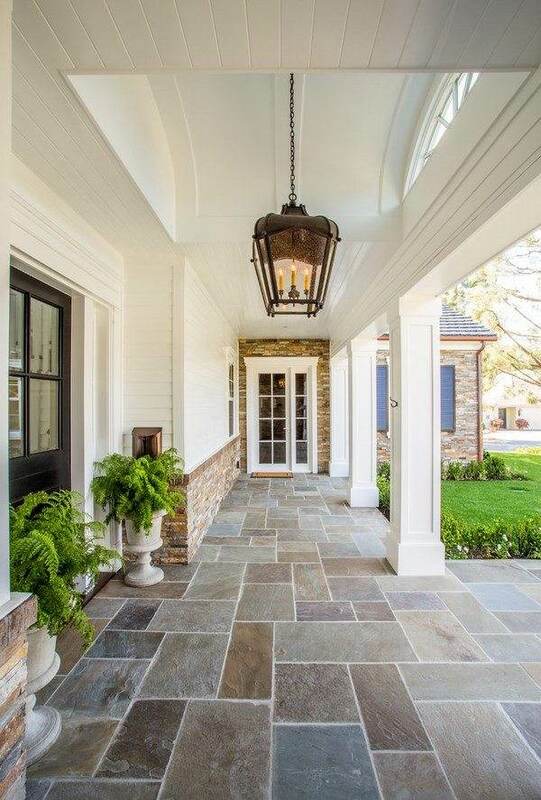 You need to choose a material that will work with the architectural style of the main house so that the porch blends harmoniously with the exterior design of the home. 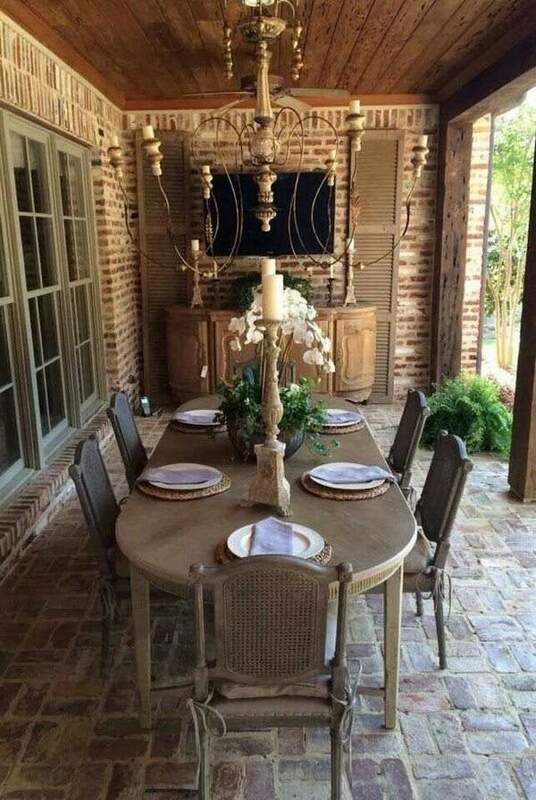 For example, concrete porch flooring is not a god option for rustic or Mediterranean style, as these decor styles are based on using natural materials like wood, natural stone, slate, brick, pavers, etc. For contemporary styled homes you can choose from a number of porch flooring options – stamped concrete, tiles, tongue and groove composite, etc. 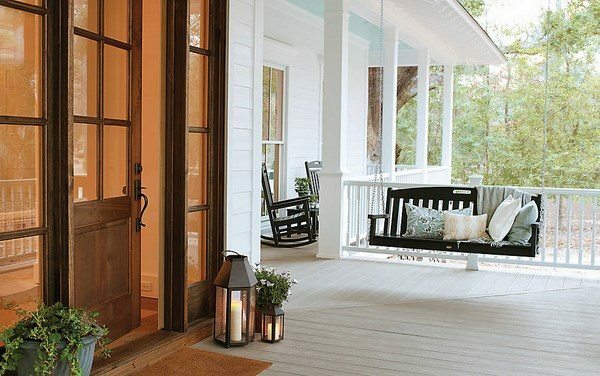 Each material has its own pros and cons and we shall have a look at some of the most popular porch flooring ideas so that you can choose the best option for your home. Without any doubt, the choice of flooring material is a major feature of the overall appearance of the house. 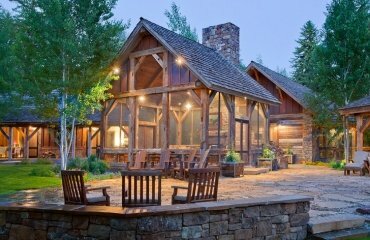 It adds to the curb appeal, to the pleasure of using the porch area and the convenience of your family members and visitors. Some people prefer wood flooring, some opt for stone and tile while others give their preference to concrete, pavers or bricks. 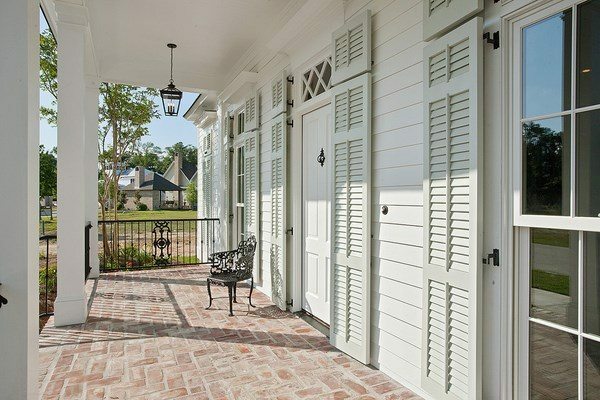 Here are the major advantages and disadvantages of the different types of porch flooring materials. Wood adds additional aesthetic value to the space. 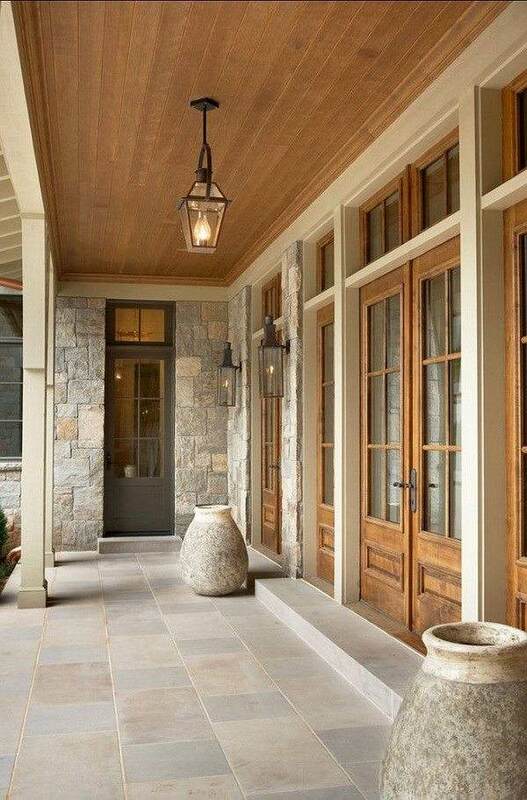 It is a favorite material and widely used as porch flooring. Since it is covered under a porch roof, homeowners do not worry about damages caused by rain, sun exposure or temperature differences. 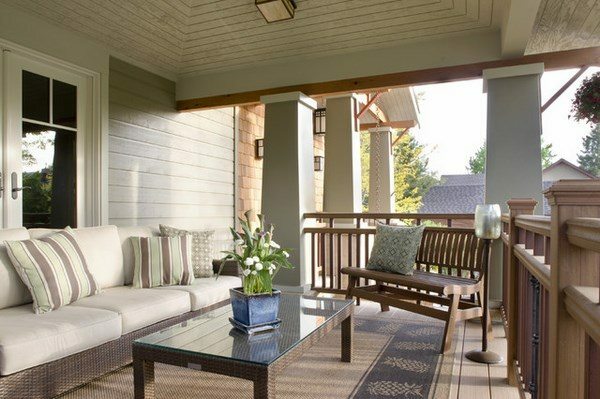 Wood adds texture to the appearance and it can be painted or stained to match the color scheme of the exterior design. Usually, when talking about wood porch flooring, pressure treated wood is meant as it is the most affordable and economical choice for exterior flooring. Pressure treated softwood like yellow pine wood is among the top choices of customers. Pressure treated pine is durable, weather resistant, inexpensive, and long lasting. 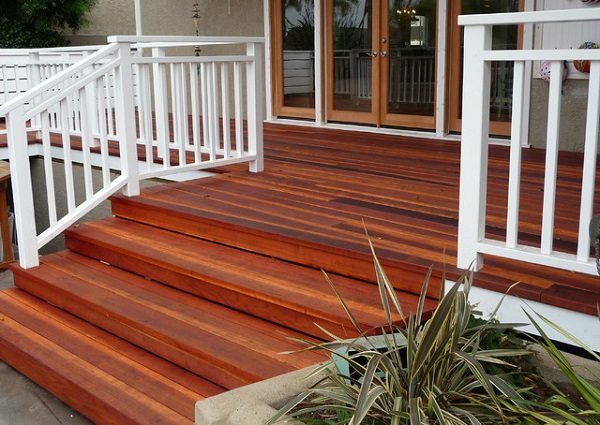 Redwood porch flooring offers a magnificent red hue and is often the choice of landscape architects for the beautiful appearance. It is an ideal option for porch flooring as it stays flat and straight. 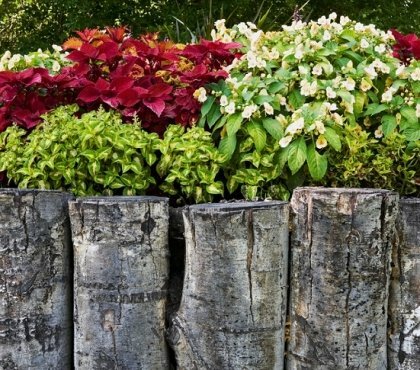 Redwood is easy to cut, durable and resistant to elements, rot, mold, and insects. 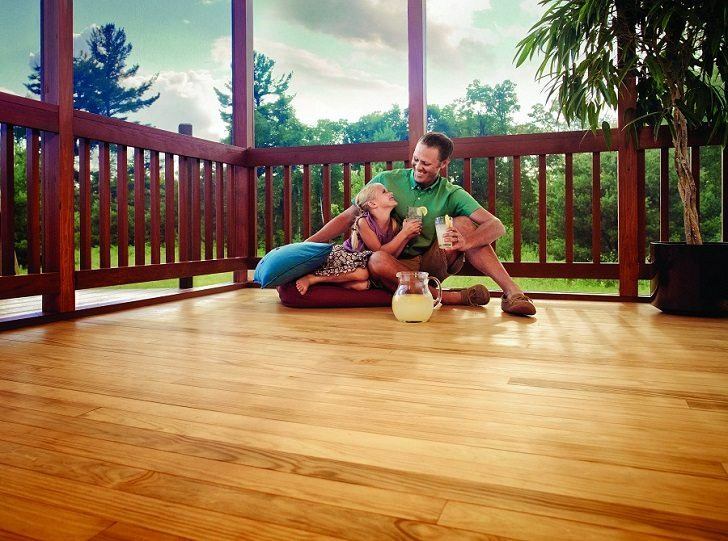 Redwood is the most maintenance-free porch flooring material. It does not shrink, warp or crack and will last for ten or twenty years without a problem and does not require to be treated with a wood sealing agent. 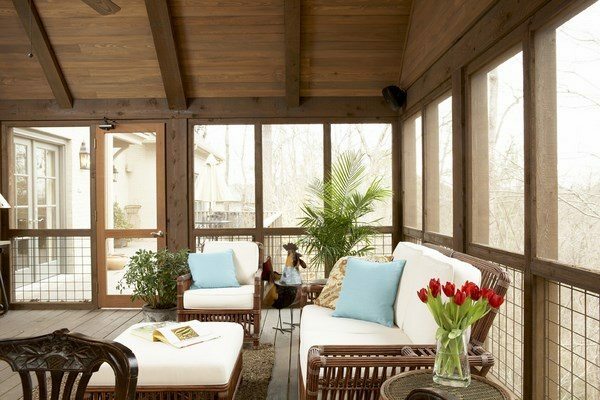 Cedar wood is another porch flooring option when you want an attractive porch. It is resistant to weather, mold, rot, and insects and does not require a sealant. However, just like redwood, cedar flooring has a high price tag and depending on the size of your porch it may be a significant investment if you opted for redwood or cedar. Ipe wood is in the group of hardwoods. It is dense, heavy, very strong and highly resistant to damage from insects and moisture. It does not crack or splinter and will not decay. 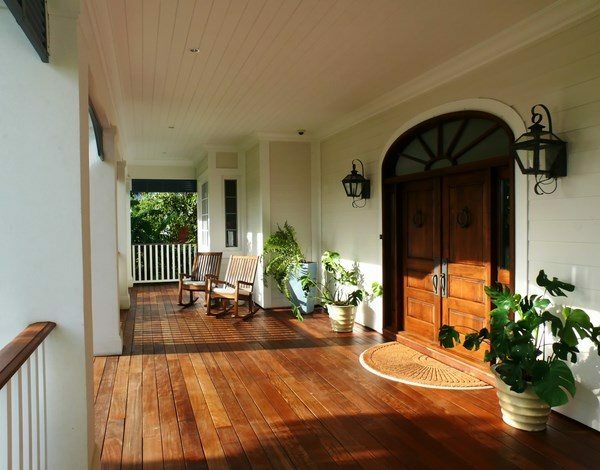 Ipe wood can be a great feature as a wood porch flooring material and in addition, it is also fire resistant. 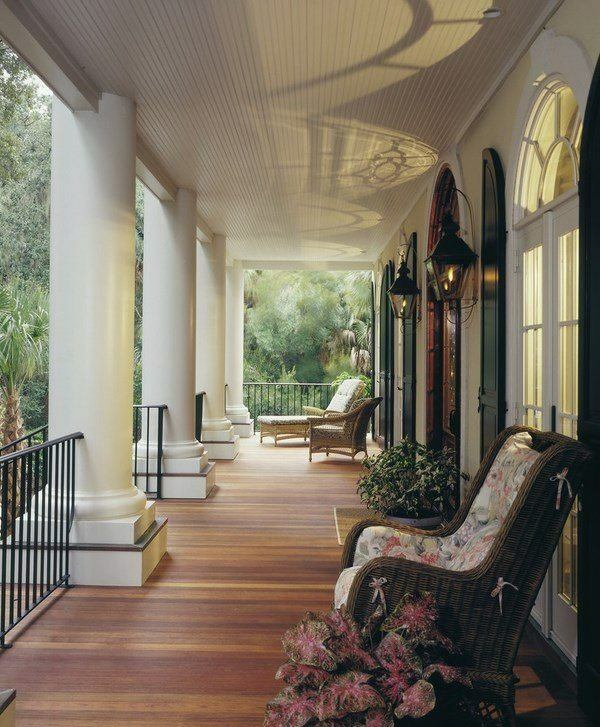 Ipe porch flooring should last for many years without any chemical treatment. Its deep red-brown color turns silvery when exposed to direct sunlight. 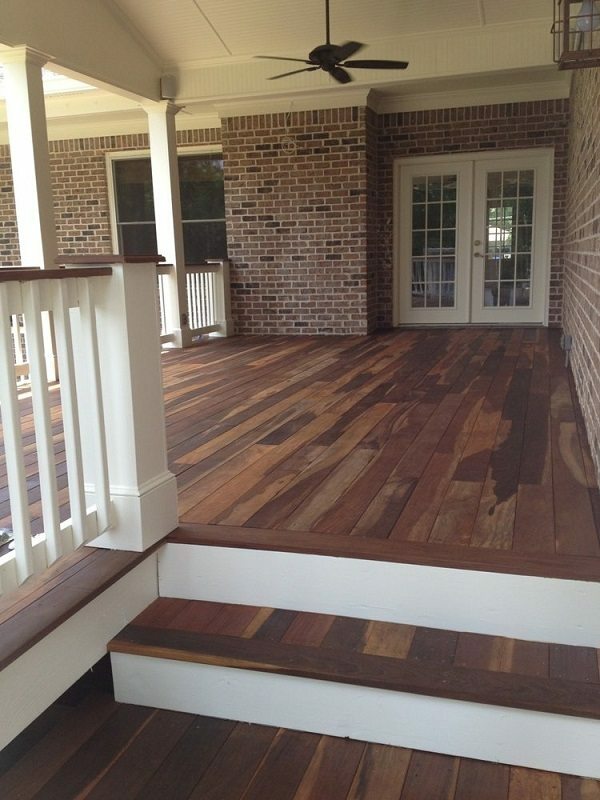 Tigerwood porch flooring is another great option which adds to the visual appeal of the porch. 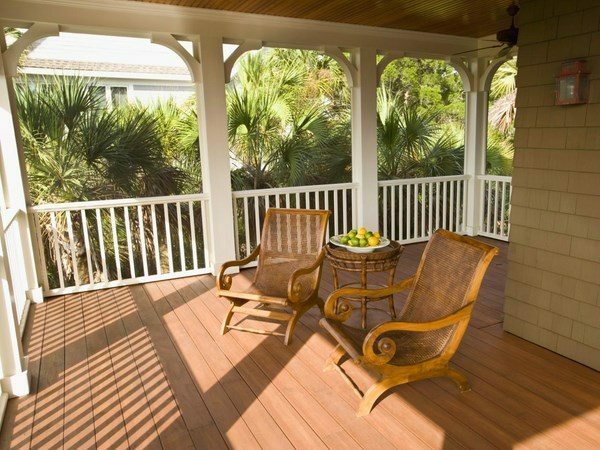 Resistant to insects and termites, easily stained and exceptionally durable, tigerwood porch flooring requires professional tools when installed, as it dulls blades rather quickly. 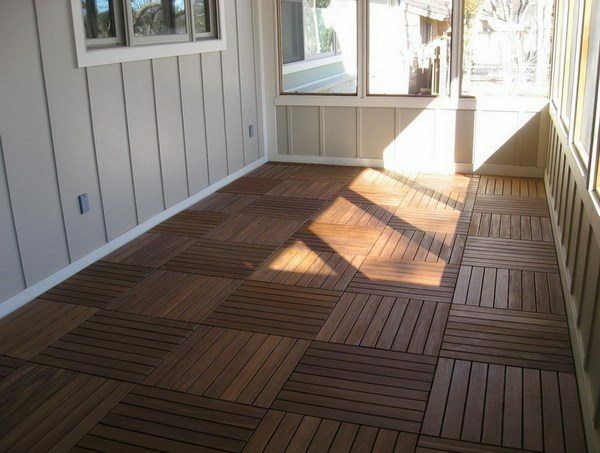 Wood tiles are a cost effective porch flooring option on the market. They are usually specially treated to be durable and resistant to moisture and UV rays. 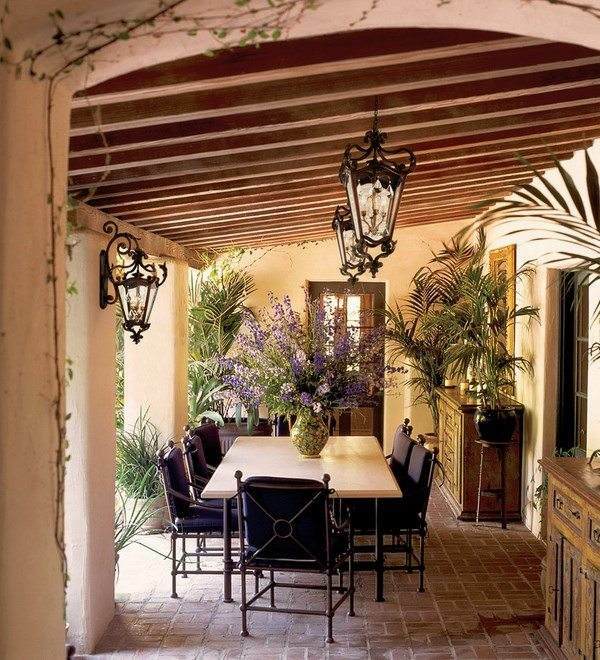 Wood tiles can give you a beautiful porch look if you are on a budget. The tiles will not scratch or dent easily and you will have a durable flooring with a natural look. 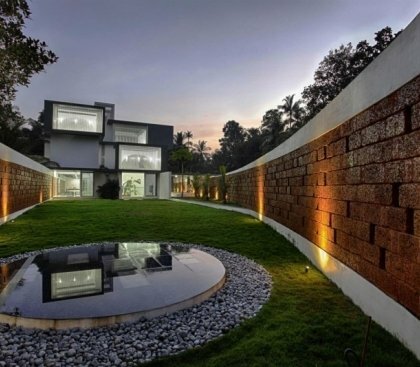 Brick floor is an option which is warm, eco-friendly, natural and very durable. Brick pavers are made from clay fired hard into tiles and when installed on the porch floor, brick pavers add a great charm to the design. 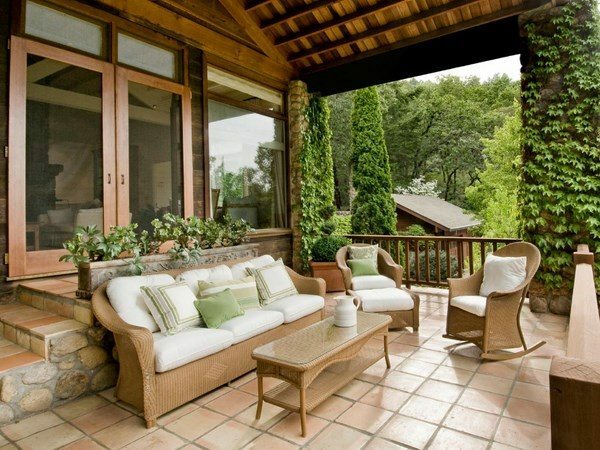 The main advantage of brick porch flooring is its durability. Brick pavers are resistant to extreme winds, humidity, stains and are one of the best options for areas with high traffic. Another advantage of brick pavers is their fire resistance. In terms of environmental friendliness, brick porch floor takes one of the top places, as the pavers are made of natural materials and are fully recyclable. 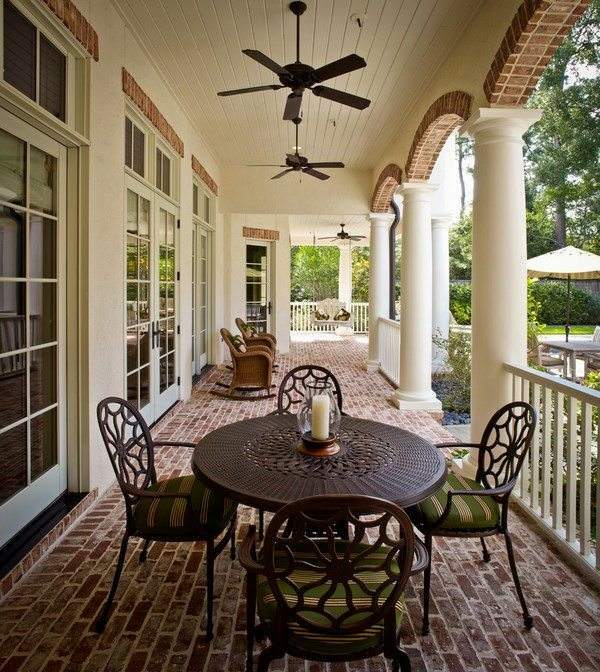 Brick porch flooring is warm to the touch and maintains a stable temperature. It does not get extremely cold like natural stone does. 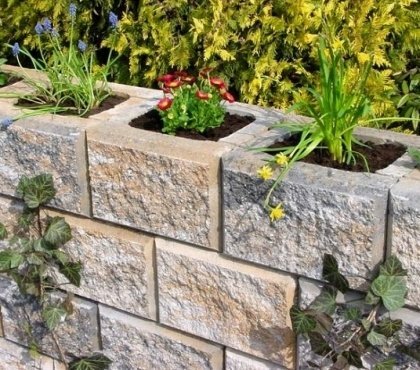 In addition, it looks very attractive and as an alternative to natural stone, it offers many benefits. Brick pavers come in a wide range of shapes and sizes and can be arranged in unique designs and patterns like basketweave, herringbone and circular. It is advisable that you treat your porch flooring with a UV shield chemical sealant after installation as this will help maintain the original look of the bricks and protects them from the elements. 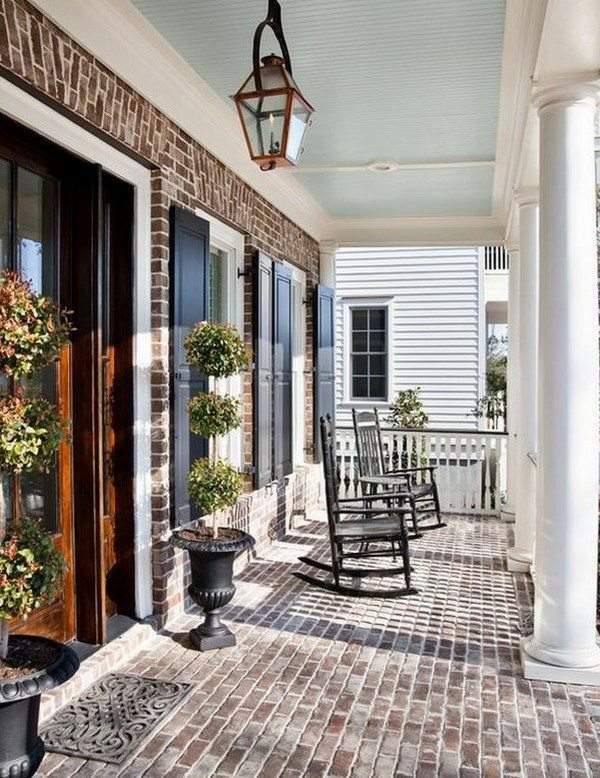 In terms of maintenance, brick porch flooring is simple to care for. It is easily cleaned and you will enjoy its perfect appearance for decades. On the downside of brick pavers for porches is the hardness of the material. You can break or ruin the surface if you dropped heavy objects. Brick pavers tend to lose their initial color with time and some homeowners prefer a weathered look of the brick flooring while others do not. Of course, this is all about personal taste and overall design concept. 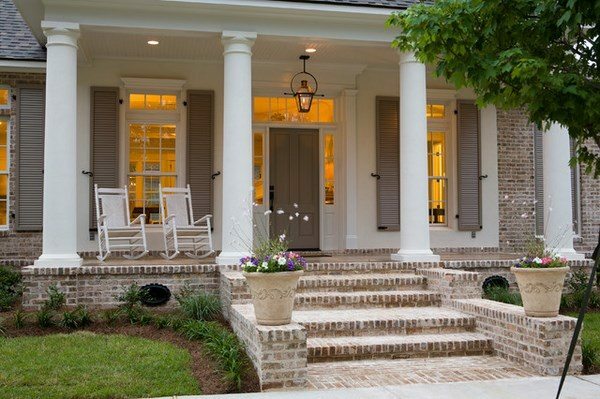 A weathered appearance will work brilliantly with old-world styled exteriors. You should keep in mind that bricks are very porous, despite the fact that they look solid and hard. Liquids are quickly absorbed, if the flooring is not treated and may cause staining. Slate comes in a variety of quality grades and when it comes to porch flooring you should look for high quality slate. The main advantages of slate porch flooring are the stain resistance and the non-slip characteristics. 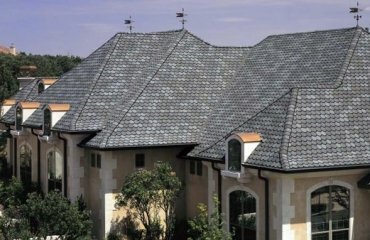 High-end slate is non-porous while cheaper and lower grade slate can be stained. 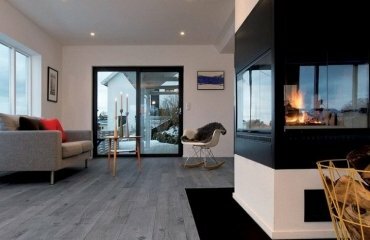 Slate flooring is also resistant to fire as well as water. 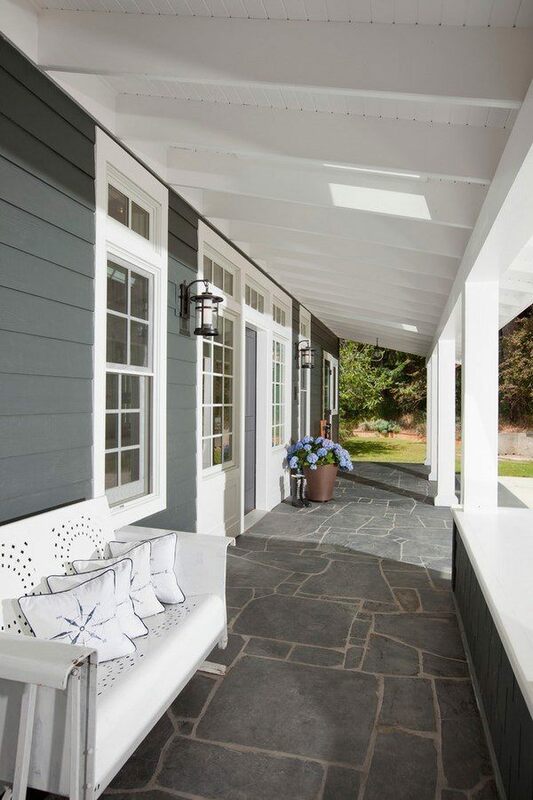 Due to its durability slate porch flooring is a good choice for areas with high traffic and high-end slate will work great in areas with high levels of moisture. It is hard but not impossible to crack or chip slate flooring. In terms of appearance, slate flooring comes in different colors, but not in as many varieties as other materials. Color variations in slate tiles are a result of the minerals present in the particular area where the slate is quarried and it is sometimes hard to achieve a uniform look of the floor. The biggest con of slate flooring is, perhaps, the price. It is one of the most expensive options, especially high end grades. 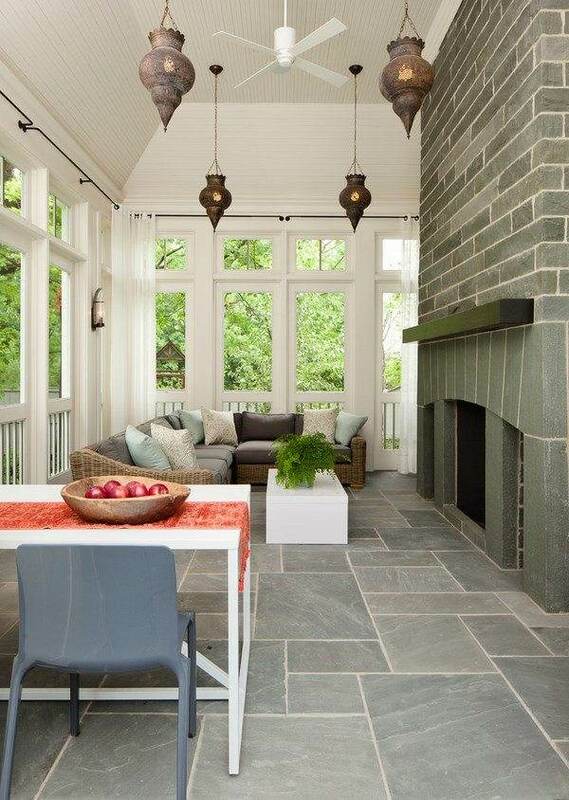 You will need a significant investment if you have a large porch area and want to install slate flooring. 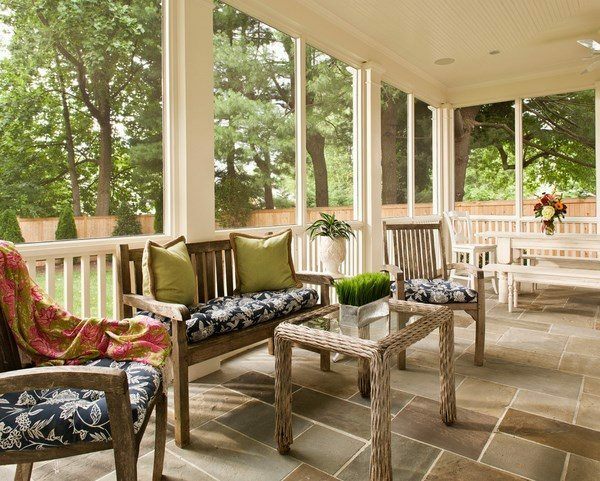 A popular flooring option for screened porch is using porcelain tiles. The numerous colors, styles, and sizes of porcelain tile provide thousands of design opportunities and you can create a beautiful floor with a unique appearance. 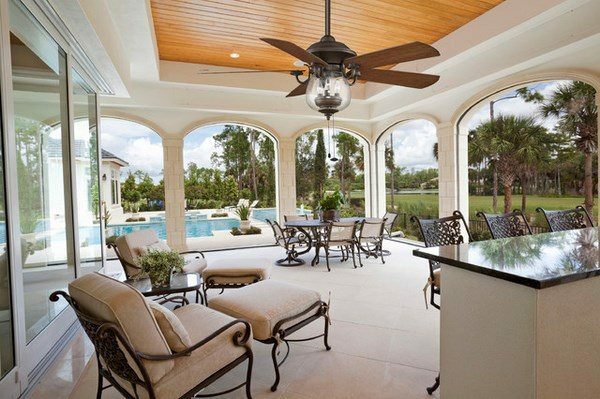 Porcelain tiles are denser when compared with ceramic tiles, which makes them a better option for porch flooring, as they do not absorb moisture and are not susceptible to breaking in case of frost. 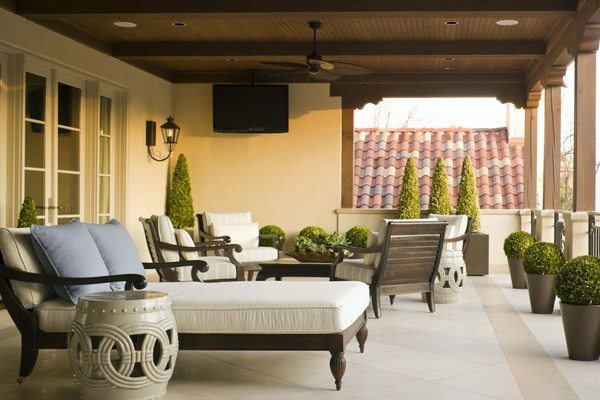 Porcelain tiles can be installed over an existing wood flooring, but experts recommend to have a concrete foundation beneath the tiles as a concrete base is stronger and will be a better support for your porch flooring. Vinyl porch flooring offers many advantages – it is resistant to water, stains, vermin, mold, as well as elements – wind, snow and temperatures. It is almost maintenance free and easy to clean. Usually vinyl flooring is UV treated and is an affordable flooring option. Vinyl planks and boards are installed easily. However, vinyl is not a natural material, it is not biodegradable and can be toxic. Another disadvantage of vinyl floorings is that with time they lose their appearance and fade when exposed to sunlight. 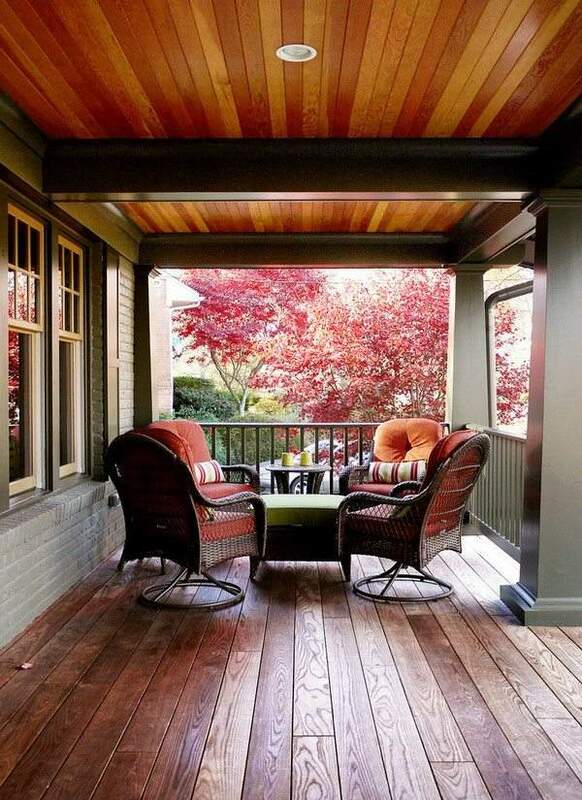 Wood plastic composite floorings, as a porch flooring option, are gaining popularity as wood splinter or crack. Composite flooring comes in a variety of colors and can have the appearance of natural wood. Many manufacturers offer a warranty period of about 10-20 years which means your composite porch flooring will last for decades. 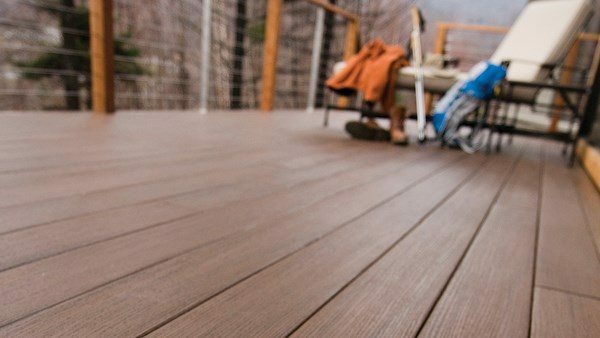 High-end wood plastic composite flooring may have a higher price tag, but it is worth investing in high quality as low grade composites may fade over time and you may have a more plastic than wood appearance. 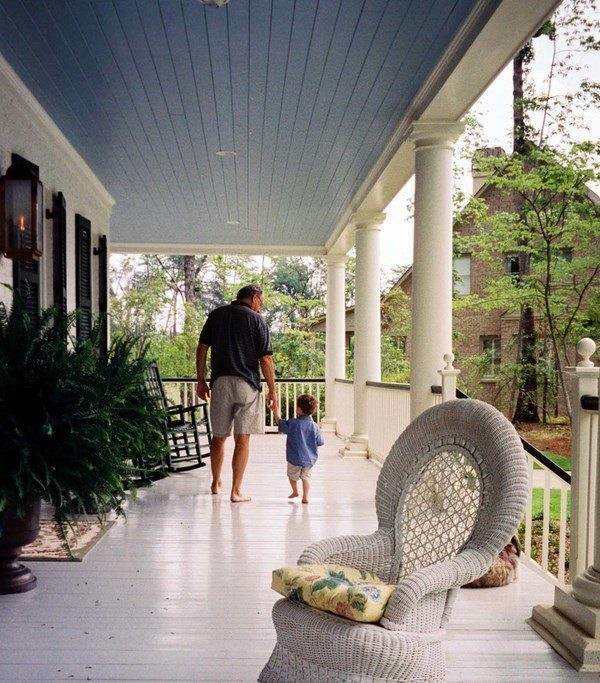 WPC porch flooring is maintenance free and does not require sealing or staining. However, the fact that WPC is not a natural material is a major consideration for many homeowners. The material is not biodegradable and does not fall in the category of environmentally friendly flooring options. 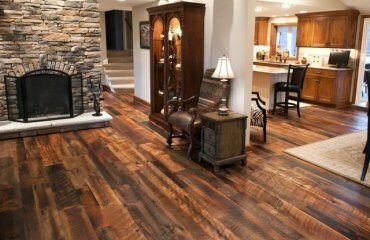 As you see, these are just some of the many flooring options to choose from. 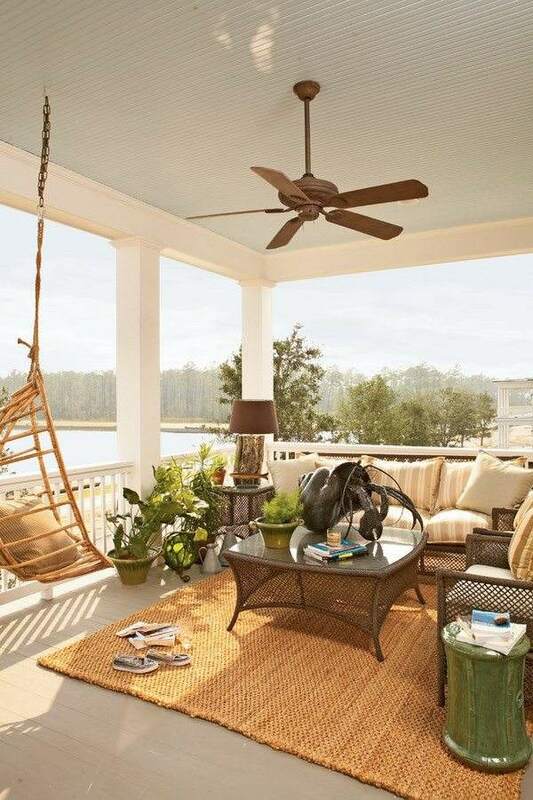 When choosing among the ideas for porch flooring, you need to choose a material which does not trap water and is able to withstand the elements.